This is not your grandfather's Snake Can! Why? What can be so different? Because you don't have to switch the empty can for the snake-filled one! That's what makes The Jelly Bean Snake Can so amazing and why we recommend it so highly at AmazeKids. Imagine this. You offer some jellybeans to a helper, as you open the can. He takes one or two out. You close the can and later, you have another helper take a chip from the can. The can remains in plain sight. You don't have to secretly exchange it for a snake-filled can! Then, whenever you want, you open the can and two eight-inch mini-snakes comes springing out into the audience. Better yet, they spring into your face! How is this possible? Our partners at Graffix Magic have created a Snake Can that's gimmicked just the way we like it. The special design inside combines with the graphics on the outside to make this a very deceptive prop. It's so easy to work that you'll be able to include it in your kid show the day after it arrives in the mail. This has always been one very funny prop, and now, with this great design, a real fooler. Extra benefit: you only need to carry one can in your case! 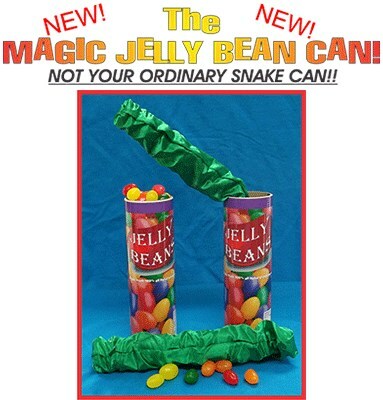 Get the Jelly Bean Snake Can put a "sweet surprise" into your next kid show!